The great efficiency of building an MVP is one of the important aspects which make Ruby on Rails perfect choice of technology for the start-ups. 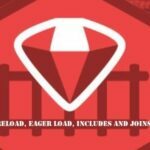 Let’s dig a bit deeper to understand what makes Ruby on Rails great for MVP development. The process of MVP development can be accomplished rather quickly using Ruby on Rails as compared to most other technologies which are mainly, owing to its ready-to-use modules and the built-in development tools. This gives way to a far more efficient development process for the application. Ruby being a concise and crisp programming language, your developers need not write the complex codes endlessly. Moreover, there is only little they would need to modify or discard while fine-tuning the MVP according to the end-users’ feedback. 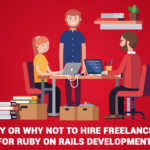 Ruby on Rails follows a few conventions which are meant to improve the productivity of development and to keep the things simple and easily understood by all the developers. This is the reason why unlike many other programming languages, ruby does not require extensive set-up and configuration at the beginning of the project. Owing to its this simple approach, the developers need to only specify the aspects that lie out of the convention. Being a open source web based framework, Ruby on Rails technology avails your developers with a good number of software libraries available for free. 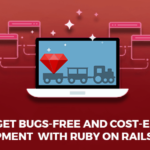 Easy access to the pre-built and well-tested pieces of code, ready for use in your projects for Ruby on Rails makes it possible for your developer to build complex features and functionality rather speedily while eliminating the need to build everything from scratch. This ease of developing a functional prototype quickly makes it perfect for developing MVP for your project. The new security features that Ruby on Rails keeps on regularly introducing, serve to make the framework as secure as possible. This is the reason why start-ups aiming to keep their data secured as well as up-to-date typically choose this framework. 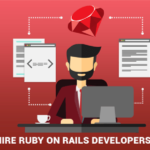 Also, having continuously evolved over the years, Ruby on Rails has matured into a highly stable technology equipped with the features such as Object-oriented and functional programming, smooth compatibility with the advanced frameworks including AngularJS and multi-platform compatibility. This makes it versatile for developing MVor start-ups. Ruby on Rails is a technology flexible enough to not bind an existing application with any specific database. In such a case, the backend database is easy to be modified without having to bother about the code changes. Since the MVP process requires the focus to be on the development of a product prototype, this flexibility to change without having to affect the code is a particularly critical advantage Ruby on Rails imparts. This makes it a perfect tool for developing the MVP for any start-up. 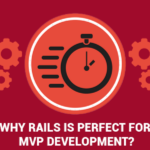 So, we can conclude that MVP development using Ruby on Rails keeps things efficient, neat and clean while avoiding any unrequired repetition with a clear focus on just the key features and functionality of the app which need to be achieved. The clarity of the features and modules in Ruby, plays an important role in making it work for your start-up projects well. Railscarma is involved in executing Rails projects from end-to-end and with our skill and talent in development, training and deployment, we have been actively contributing back to the Rails Community. Looking for customized ruby on rails application development or looking to hire ruby on rails developer ? Contact us and let us get started now!